is back on tonight! For a recap of the last episode check out the Gossip Girl blog HERE. Blair in another great Milly piece. Stay tuned for a full fashion recap after the episode! okay- blonde question of the day- is it back on (new) starting tonight?!! biting my nails in anticipation! Oh my gosh, I can't believe I forgot this starts tonight?!! I'm so excited, you made my Monday! The only thing that makes this blah January worthwhile is the return of GG! I love the new script up top -- very elegant. 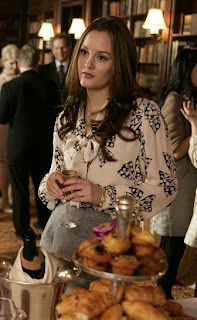 I believe serena is wearing a studded DVF black sweater dress in the picture with blair in milly. I can't find it online though! I am SO excited our show returns tonight! Life has not been complete without my B moments! are new this week. Hollla. I am oh so excited for Gossip Girl. Can't wait!!! I didn't even know that it was starting back tonight!! You've made my night! I'm so excited for GG and One Tree Hill as well! !